Japa means ‘to rotate’ and involves the continuous rotation of a mala (prayer beads) in synchronization with a mantra (chant). The rhythmic sound of the mantra and the action of moving along the string of beads stills the mind – leading to deep meditation. Mantra means ‘revealed sound’ and their power lies not in the meaning of the words chanted but in the sound vibrations created when the mantra is spoken verbally, or inwardly. Malas are usually made up of 108 beads – or in multiples of 9 – and have a Geru/Meru or Sumeru bead. This is a larger bead, not part of the 108 and the guiding bead marking the beginning and end of the mala. This represents the top of the psychic passage called the sushumna and so the sumeru bead is also known as the bindu. The mala may also consist of marker beads so the the meditator knows when they are coming to the end of the 108 chants. Start from the sumeru bead and rhythmically rotate the mala, bead by bead until reaching the sumeru bead again. If repeating the 108 mantras – rotate the mala and go back; so as not to cross the sumeru bead. The heart is described as the source of the infinite and our connection with the divine and God. From the heart there are 108 main nadis, or channels of energy, that go from the heart to all the extremities and after reciting a mantra 108 times you have purified your body (Swami Muktananda). 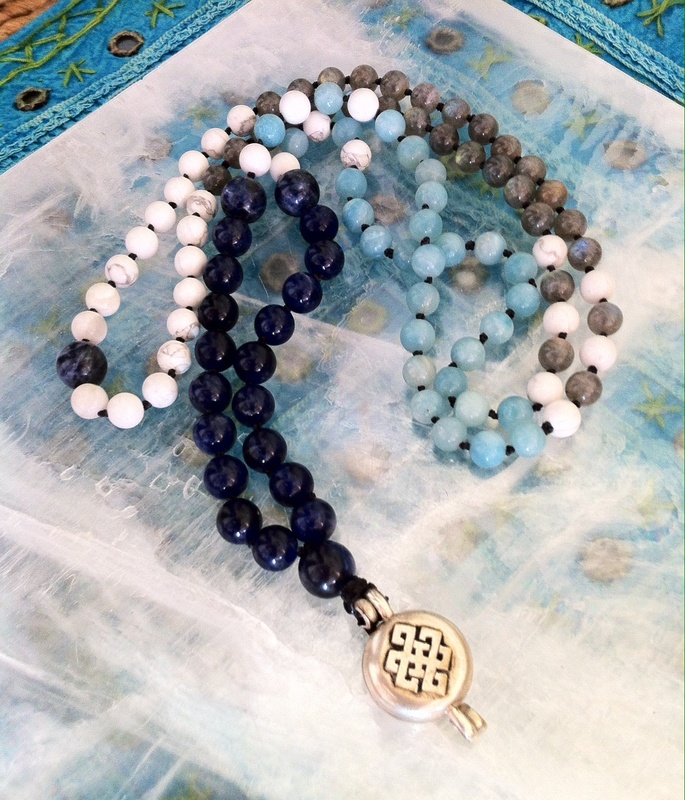 Plus not only does the intention of the mantra flow healing energy through you – but also the healing and therapeutic qualities of any crystals included in the mala. In our bodies there are also 108 Marmas. Marmas are vital points in our body where muscle, bones, joints, arteries and nerves meet creating the vital flow of life. Traditionally there is a knot between each bead. Malas are special – a wonderful meditational tool, can be worn as therapeutic jewellery and perfect to place on the body, as needed, for healing. Used daily, a mala will become impregnated with very positive energy. why the sumeru should not be crossed and the mala be hidden ? why can’t we rotate in just one direction ?